One of my favorite Morrissey songs. He writes about the bourgeois; the middle-class that are wanna-be elites; the elites, who become detached and are confined to their own pleasure. I think even if we are not necessarily on the beaches, we are often willing accomplices to violence and extinction and the socialization of these things as ‘normal’ while we pay attention only to small worlds and our so-called ‘personal’ situations and lives. It’s often a clever way that lives are situated along the freedoms and confines of a life structured for us by historical power-relations and struggles, with their dominances and resistances. I think, always, of Michel Foucault and others who have written along his thinking, such as Judith Butler for instance, in that POWER is not just a dominance ‘over’ things and people and events and everything, but also produces, creates, makes. Jaded? Stagnation? I don’t think so. I call them sociopaths. And there are too too many in this world. Most of them are running our governments and transnational corporations. The large group in the world want to be like that and they work hard at having enough and acting just right in order to access it. 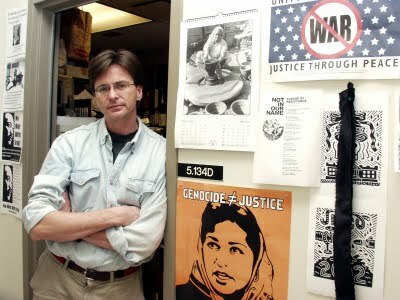 There are activists who are wanting the whole world to become that way and they call themselves social justice workers. I’m sorry but Freedom is NOT middle-class elitist. Freedom and empowerment in relation to resources, in relation to attitudes, differences, cultures, etc. are not about accessing the privileges of the violent. Let’s *not* do this. Let’s *not* wish this upon us. If so, why not change directions, concerns, priorities, worldviews? Small steps, big steps, steps. But would you please keep the noise down low? Mikail Aslan (on the left of the photo) and Ahmet Aslan (on the right of the photo), although unrelated to each other by family heritage, are among the elites and considered amongst the most precious modern artists who work to tell, preserve and empower the people of the Dersim region of what is considered ‘Tunceli’ in eastern Turkey today. Through their songs, both modern and ancient, traditional and roots-fusion, the historical/cultural memory of spiritual traditions, loss, genocide, mourning, isolation, stigmatization, marginalization and state destruction, are woven into the hearts and minds of whoever will listen. Their music is usually accompanied with the stories of the elders who’ve experienced the 1937-38 events that should be considered an aspect of the continual genocidal actions against the culture and people of the region. Or they would be songs of the displaced who fled the government forest and village burnings and purges during the 1990s, and the continual repression of its people and the collectively grieving population of Dersim, the music also tells their stories. Many of their songs are traditional songs, slightly modernized to adapt to the modern times, while other songs are left as they were sung centuries ago. Many of their songs are songs of mourning that would be sung by everyday people on the streets and roads of the villages while their relations were disappeared, imprisoned, and/or killed by government forces. The Dersim region in Eastern Turkey, was told to the public to be the land of terrorism and propaganda had been created to present the region as dangerous and of outlaws. Certainly those who practiced non-Muslim worldviews such as Alevism and Christianity, often fled to the Dersim region, where the rugged mountainous territory was easy to protect from encroaching forces. The Ottoman governments, before the formation of the Turkish Republic in 1923, tried for centuries to subjugate the Dersim region. The people of the region refused to live via modernizing state laws and the Islamicization of their worldviews, They refused to pay taxes and send their sons into the Ottoman military forces because they felt the the government wanted to control them through these means. The Dersim region was very poor and because they were isolated, their subsistence also included banditry, while others we wealthier–benefiting from working the the Turkish state. During the height of the Armenian pogroms and genocide, many Dersim Kurds helped thousands of Armenians by taking them into their homes, as they lived amongst them for centuries, in harmony. During the 1915 intensification of Armenian genocide, many Kurds assisted the American Protestant missionaries form an underground railroad to help Armenians escape out of Turkey into Russia. Other more fundamentalist groups in Dersim took advantage of the pogroms and participated in assisting the Turkish state in the Armenian cleansings. Today, some Turkish officials used Dersim’s Armenian connection as some sort of ‘negative’ trait, which shows the long history of animosity against the Armenian Christians who were a threat to mainstream Islamic officials. For the most part, in Dersim, the Armenians and the Dersim Kurds lived side-by-side without issue. The Dersimian languages were mainly Zazaki and Kurmanji (Northern Kurdish dialect) and they practiced a form of Alevi worldview and ritual that was distinct from the Bektashi Alevism that is being mainstreamed in Turkey today. Many Dersim Alevi religious terms have Armenian words and forms of worship, as well as pre-Christian, pre-Islamic forms, including Zorastrianism and Shi’a Islamic forms as well. The Dersim region was distinct in its cultural forms, held together by strong bands of men who knew the mountains well and were ruthless in defense of the region. However, they believed in diplomacy and negotiation and proper mediation in conflict. These were all betrayed by the early Turkish state. As early as 1925, plans to transform eastern Turkey and to split families and destroy the region, was planned. In the rest of Turkey, people learned of a ‘rebellion’ in Dersim and the need for the subjugation of the region. There was really never a ‘rebellion’ in the traditional sense of a wholescale anti-government movement. The early Turkish government used such terms to give it the go-ahead in a genocidal campaign that would destroy its leadership and split the villages and families apart and to assimilate the young into a particular brand of state Turkishness that even for many Turkish-identified people, has outgrown in its ‘cover’ and its place in modern Turkey. 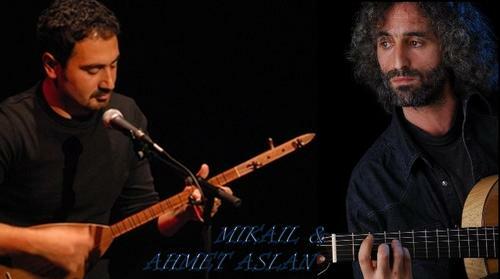 Through their fine music and personalities, Mikail Aslan and Ahmet Aslan bring us the realities of grief, joy, mourning, memory, the strength, and the courage of the Dersim people and their efforts toward cultural survival. For more information in English on Dersim, I have included a website that is Armenian. I include this because most of the information written about Dersim in the English language, begin with official state claims and versions, such as a ‘suppression of a rebellion’ which was a state propaganda version and pretext for ethnic/cultural cleansing for state-building. Please be careful when reading any historical texts, of cultures that we are not familiar with, as even well-meaning people may tow the state version of events and lives. 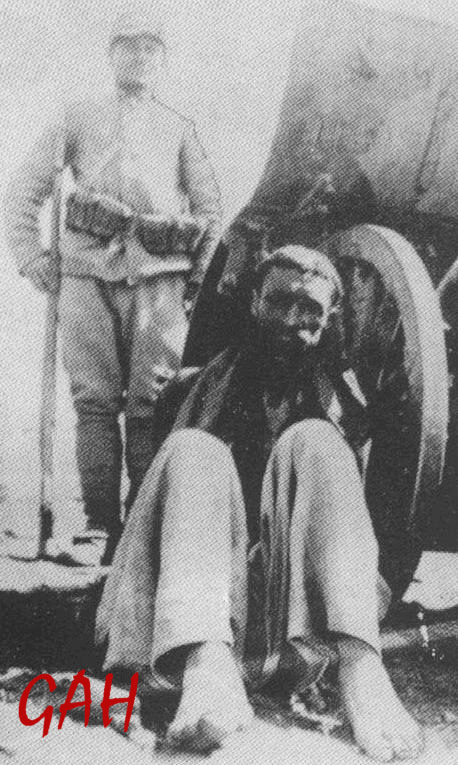 Above Photo of a Dersim villager hunted and captured by the Turkish army during the 1937-38 genocidal campaign. I am a person who has been bullied. As a child in both Japan and the United States, I was the target of bullying. Both of my parents were also targeted. The imagined ideal, given to us by our cultures and societies, in the context of certain times, when certain things are happening, allow bullying as a fabric of legitimizing ‘survival of the fittest’ memes that circulate as universal natural sciences, masquerading as social science as well. We handle being targeted differently, according to severity, our personalities, the communities we live in or transition into, the time period and circumstances, as well as an effect that anyone hardly mentions: accumulation. Bullying is not just about a person or group targeting someone for their looks and/or behavior or race and other factors perceived as ‘go’ lights to offend and abuse, maim and kill spirits. It is mixed with national and cultural histories as well. It is usually repetitive because it is the relationship between dominant and subordinate. As an example; in my mother’s case, she was born in China, then her family fled to Japan when she was little. Her mother was assassinated by national Japanese soldiers. My mother’s mother was Chinese and Austrian. All non-Japanese in Japan in the late 1930s and early 1940s, were suspect and were mostly accused of being spies. In Japanese schools and neighborhoods, under the fascist dictatorship of Tojo, the police were basically terrorists. In addition, some people in every neighborhood would be branded ‘good citizens’ by being the neighborhood watch, reporting to authorities and being free to hold people and situations they deemed ‘un-national’ and unpatriotic. Of course. As one can guess from this scenario, the racism intensifies, legitimizing very harsh penalties for Japanese who even socialize with or are seen with a non-Japanese, much less being free to marry or whose parents and relations were from different nations and cultures. This scenario also legitimates all sorts of lies and stories that could be made as a tool of power if one simply doesn’t like someone. Someone may invent a sordid story which suddenly becomes more true and believable at this point, legitimizing violence. This scenario, is not too different from other areas and times around the world, when the building of a nation rests on certain intensifications of racism and other forms of marginalizations including local stigmas, legitimating superiorities and punishments. In addition, my mother experienced being bombed by the Americans and having an older sister killed in Hiroshima. Another older sister of my mother’s committed suicide after social stigmatization. She had been kidnapped and made a comfort woman for the Japanese imperial army. My mother was bullied in elementary and junior high school in Japan, for being non-pure Japanese. In high school, my mother became a bully, belonging to a band of girls feared at her school. It is not that one decides, necessarily. The circumstances warrant some response. In any case, violence does not just go away. It always has effects. One can imagine this tender beautiful, funny woman who is my mother, at certain times, would become an ugly and scary, violent woman. I would sometimes fear her as much as love her as a mother and confidant. The fabric of all of our lives are made of this. Those people who experience non-violence in the home, have most likely been shielded from the exploitative violences that have shaped privilege. Privilege is sometimes un-thought, unspoken. For instance, a Japanese woman who has experienced fascist governments, suicides, daily humiliations by classmates, abuse and being ordered around by a stepmother and older brother and is bombed by the Americans everyday and a host of other things, cannot be told to be peaceful and quiet and good. While that is true, many Americans think that they should, while their families were the ones building the bombs and making the American war effort succeed without bombs to run from or fascist government dictates. They have been told that the Japanese were bugs that should be smashed off of the face of the earth and that Japanese knew nothing of democracy. It was a sham, a propaganda, a way to be superior. The Japanese would also make stories of the Americans and this would keep the violence at a high level in both countries. Whether one was a soldier or not, it doesn’t matter. The racist hate-mails I receive in the present day, are not from former US soldiers in the World War fighting the Japanese. People calling me ‘Jap’ and slant-eye that should die, often come from young people. Their grandparents have passed it down. There is a certain worldview. It is politically incorrect so it is not around on postcards and bugs bunny cartoon shows, or in magazines as they were regularlyduring the war. The hatred is kept private, and comes out towards people like myself, unseen to others. It is often a surprise to classmates and friends and sometimes those racist-carrying people would be defended and I would be labeled a paranoid lunatic who is making it up. This scenario is one such generalized example of the legacy of racism and legitimate bullying and how it is carried forward. It looks differently according to climate and circumstance, etc. but it is still there. Other people have gone through changes about this. In my mother’s case, being told to be ‘good’ by people who are in a privileged position in relation to the history between the Japanese and the Americans, the being told is a furthering of the bullying. It already establishes a positioning in relation to violence. The privileged who carry out the violence, then continues to tell people how they should act in relation to the violence? This is violence as well. My mother did not invent fascism. She was a little girl in a country that was ruled by fascist leaders. It was not pretty. But neither was what Woodrow Wilson and the other bankers and corporatists and the military leaders of the US and England did, continuing to fabricate reasons to amass finances and resource-power through militarization and superiority over the Asian nations, attempting to colonize before the World War. Bullying has many faces. The inter-personal bullying is a part of how nation-states can become strong. Bullying is a way in which we may choose ‘the strong’ over the weak. The CIA recruits people who do not have feelings and who can carry out orders with a smile. They know how to smile and be charming. Being detached from compassion is a part of smiling and being charming. They don’t have to be mutually exclusive. Some of the coldest and calculating people are the most charming. Yet they are the quiet bullies. Some are more overtly aggressive while others do it covertly. Torturing is a learned thing. In the movie ‘ The Bully Project‘ ( http://www.thebullyproject.com/_/Bully_Project_home.html) one notes in one of the stories that even after a youth kills himself, the bullies come to school wearing fake nooses around their necks as a furthering torment. It is continuing fun. It is not thought of as something bad or wrong. There are smiles and laughter and joinings in. The school board continued to ignore it, because it was embarrassing to them. They wanted it quiet. The parents had fought long and hard and yet the school officials kept it hushed. These parents, however, did not give up. It is sad that so many of the parents of the other children (the majority), did nothing but listen to the speeches like it was entertainment, telling their children to stay away from the families of the bullied. In this way, the institution, the school, condones the bullies. It knew it was. In doing anthropological/sociological research on prison systems, and the spread of US systems into Turkey and Japan, for instance, which I have done, it became clear how prison systems are related to bullying and the spread of military superiority. Time and again, when interviewing prisoners and former prisoners as well as prison guards and interrogators, whether reading their accounts or interviewing them myself, that it was important that the military had those who are expert bullies who felt nothing in relation to perpetrating interrogations and torture. Nowadays, in the television programs and the most popular movies, violent and malevolent speech and physical brutality as a way of communicating distaste and devaluing the other is commonplace. Smartass comments are funny, even though it is often violent. Often, nothing different can enter. As much as we think that every individual makes their own decisions, every individual is in a different position in relation to violence, and depends on class, race, and behavior in relation to masculinity and femininity continuums, body motion techniques (do I walk right? eat right? talk right? etc.). So the connection between violence, heterosexism and homophobia, patriarchy and militarism are very close in American society and most of the wealthier nations. Most likely this is becoming more true as we speak, in a globalizing world, in the wannabe countries. There is less diversity than ever before. More violence in the world than ever before. Why? I want to applaud and support The Bully Project for being one of the strongest voices to speak to bullying and its connection to nation-state, masculinity and manhood, and the non-acceptance of difference. If we cannot co-opt and/or recruit into our own fold, then we antagonize and destroy. These are the only options increasingly in the globalizing system. And we know there are most of us living, who fake it. Then we wonder why we are depressed, seeing therapists, destroying our families, getting drunk and doing drugs all the time, having addictions, etc. etc. I do not believe we need more drugs and therapists to cure. These are social problems related to the violence that is our modern and postmodern cultures, constantly being created by either our actions or our inactions. My mother turned to bullying for awhile, to combat being swallowed by bullies. that aspect of her has not changed, even though she is no longer throwing her weight around in school hallways. Others like myself, chose more silence. However, later it caught up with me and I tried to take leave of this world. It didn’t work. Suicide is an ultimate harm to oneself. I chose other routes afterwards. My father took the route of trying to assimilate. As a Black man in the US, he wanted to be the fairest, well-spoken and educated, open-minded man and was truly a humanist. But he gave up so much in order to be this. And humanism has so many problems insofar as diversity is concerned. And there are some things he does not understand because of it. Short of accusing my father of being ‘white,’ how can we communicate through difference? My father feels (at least the last few times we spoke) that all humans are alike with trivial differences. His actions also speak to this philosophy. My mother is the opposite. She feels that people are very different and this cannot be reconciled and we have to live with it. The Bully Project, which is a movie that shows the crisis in which US society shows itself in young people, yet is mostly ignored. This Project addresses questions about what is legitimated socially and about community and nation. How can a nation have nice and compassionate kids while everyday we know that bombs fall representing us, onto families who are not running governments, being killed as pawns of difference-equals-expendable? All the moral preaching won’t work. It is a lesson in hypocrisy and illegitimacy. It is a lesson in the violent underpinning of Empire and nation-building. The Bully Project is about all of us, whether we believe so or not. Where do you stand? What do we do? A junior high boy is thrown to the mat after a ‘discipline’ session by his judo instructor, with the help of the senior student and judo champion. He then, dies. This happens time and time again in Japan, and other countries, in some form, as a way of discipline. It goes that this is a fabric of our democratic society. This is what happens when violence is allowed and individualized. It takes the pressure off of the social/cultural fabric and system and places it on these individuals. This is also about gender. This also happens to women, girls, gay and LGBTQIQ folks as well, but is a regular and accepted ‘natural’ (supposedly) phenomena between males in most societies. We must protect women and children, but boys??? 108 school judo class deaths but no charges, only silence | The Japan Times Online.